In the midst of any conflict our demeanor is intended to be that of confidence - we put on a happy face. We talk victory before the final horn sounds. Even as we do so there is a certain uncertainty. In the midst of the NCAA Final Four tournament, remember back to the number of upsets. The oh-so-certain turned out to not be so. Anyone here been surprised by a diagnosis of cancer in the midst of feeling good? Institutions from family to church to empire wax and wane. Relationship ebb and flow. Verse 22 gives us an image of an appreciated reversal of an experienced loss. No matter how firm our conviction that we are going to come through some difficulty, when the certain does not come to pass, it is a relief to get to a vantage point where we can see that a stone rejected by the builders actually comes round to be either a new cornerstone or valued capstone. As we look toward the whole of scripture we see how torah and hesed confirm and comfort, in their turn, anticipated victory, loss, and reversal. Now for the hard part; does this tentativeness about victory apply to Easter? We so would like to have things settled, once and for all. This, however, too easily forgets that there will be another testing - a false pride in a certainty regarding Easter. So let's be thankful, for the moment. This is a good day to rejoice and such will hold us in the best stead possible to face the evening of a day that will open us to another darkly entombed night. Rejoice that a rejected rock has been glimpsed again. But make no mistake, it will have to be reclaimed tomorrow. "G*D preaches peace/wholeness through people like Jesus Christ." "We are witnesses of peace/wholeness in Jesus Christ." Note that the living of peace/wholeness/forgiveness (preaching) of Jesus is picked up and carried on by others, down to this day. An amazing part of Easter is not just the preaching of Jesus qua Jesus, but how that has been continued through your life and mine. As we live peace/wholeness/forgiveness, we join a line of prophets, including Jesus (remember impartiality), who bring a word of correction to a crooked world - not of condemnation, but transformation. You and I live/preach impartial peace/wholeness. Keep at it - it is completable. Where are we after all this running to and fro? Back at the beginning - The Magdalene alone, and now weeping. Twice comes the question about why the weeping? Twice usually indicates an important question. Why are you weeping these days? There is ever so much to weep about, but why are you weeping? What are you looking for that weeping is a helpful response? In this setting we are looking for that word of assurance known as being known by name. Does a lack of a sense of being known have anything to do with your weeping? At any rate, regardless of ascension language, Mary shifts from Weeping Mary to Announcing Mary. Does a lack of having something to announce have anything to do with your weeping? Look - light breaks in through cracks in hardened situations, weeping stones shout out an old "new message" - follow on and jump ahead, we are all becoming G*D.
My preference would be for this pericope to continue to verse 13. In this manner we are not simply left with a creedal statement, but we can see Life continued through us. In the absence of creed we work out our own salvation (wholeness) with fear and trembling - wrestling with G*D within us, attempting to burst through - yearning for us to become G*D.
If we are simply going to deal with the first eleven verses, then it is most helpful to deal with the first four verses, not the last four. Again the rubric is avoiding the creedal statement to find unity with G*D and Neighbor (as well as Self, One Another, and Enemy). The beginning list is as good as any to evaluate our present work, done with "fear and trembling", toward a preferred future. How do you rate your receiving and offering the following? These are far more lively processes than bowing and kneeling at the tolling of a name. In fact, it is these characteristics whereby "glory" is revealed. Steadfast love endures forever! How else could steadfastness be expressed than through time. This quality that extends beyond our present moment is what fills our present moment with rejoicing and gladness. A receiving and offering of blessing is strengthened each time we take from the storehouse of eternity and invest it in this day. This is a great enough investment that it can move us from our fear of not being saved (beloved) or not having as much success as is our due (cornerstone recognition). This movement opens gates of light to shine brightly enough for us to see an edge of tomorrow and to invest more strongly in today so we might clarify that which is coming. If you were thinking about a free and full life today, connect it with forever and march forward. The temptation to give up on belovedness comes in many guises. There were as many as 212 temptations in the American House of Representatives as that many votes were recorded against providing health care access to more people. This insensitivity to Matthew 25 is saddening even as it is understandable. There are some processes that help clarify such temptations and give courage to run counter to them. First and foremost is to be a participant in a teaching function. Indoctrinators instruct to any test they are asked to meet. Teachers learn to listen, gather new information, and apply all they know to the people and issue at hand. To teach is to learn and to learn reveals idols at work and both bring options to move around temptations. The second is like unto it - to believe one's belovedness enough to continue choosing it before any inducement to give it up (either for one's self or for another's benefit). With the gift of belovedness comes an openness and assurance that allows learning and change to trump acts developed out of despair (insult-acceptance) and control (beard-pulling). With learning and assurance we persist with what is holy (life-giving) not what is holey (moth-eaten). Pericopes that begin with phrases such as, "After he had said this," need an acknowledgement of "what went before" to which this now is an "after". In this particular there is a parable about money in the context of Jericho and Zacchaeus that has two conclusions. The first antecedent is "to all who have, more will be given; but from those who have nothing, even what they have will be taken away". What does Jesus have as he enters Jerusalem? He has his belovedness recognized in or affirmed by baptism. There are fellow-travelers who have no clout or persistence in the face of force. There are accumulated stories and events that raise the political stakes and activate principalities and power. Of these only belovedness counts in his favor. The coming events will further test and confirm belovedness. The second antecedent is, "as for enemies of mine who do not want me to be in charge -- bring them here and slaughter them in my presence." While this could well be put in the mouths of the high priests, Pilate, and Herod, it is also a challenge Jesus speaks to them with his entrance to Jerusalem. One of the issues we need to wrestle with is that of timing. Is this reversal immediate or eventual? A second issue is that of effectiveness. Is it an implicit death, their policies contain their own downfall, or is explicit, external power against power? With this setting we come to verse 40, "if these people are silenced, stones would shout." It pushes us back to belovedness. Stones have previously been seen to be the locus of potential life - water and bread. Stones are earth, stones are mud. Stones are also the money given to slaves in the preceding parable. Stones are concentrated creation. Stones are persistent in remembering what they have experienced and will stick to such no matter how they might be crushed (in fact being crushed allows them to be wind-borne to take the tale further abroad). Imagine here a city built of singing stones (aural walls in place of bejeweled walls) recounting and anticipating peace between earth and heaven, once and future, and you and me. It is this assurance of engaged belovedness and blessedness that will continue as long as Life or G*D.
So, don't get distracted by colts or cloaks - may your belovedness sing, knowing its persistence as a ground of new being. This is the 1,000th post on this blog. Quite a milestone for a distractible sprinter. In the midst of an internal celebration it is helpful to both remember and forget. Let's remember Lazarus. He had a wonderful 2nd chance and was plotted against that he wouldn't have a 3rd try. Whether 2nd or 1,000th it is important to simply be faithful in the moment. No number of iterations is holy. We remember that new things are always breaking in upon us and to fall back on past accomplishments would bring no added value, no matter how many more opportunities come around. There is a need to not coast off this high-value moment or a high school sports award. This, too, will pass away in its usefulness to respond to new occasions. We remember to be thankful for the 42nd posting and the 666th posting. Each and every posting was critical to arriving at a next and a next and a 1,000th next. And so, remembering to forget what lies behind and trusting another week will arrive for your poster boy, it is time to simply reach ahead to a preferred future already knocking on the door and to respond to a beckoning onward. May you find your own equivalent of a 1,000th posting and rejoice for seeds planted a long while ago coming to fruition and for a next opportunity to go further than can now be imagined. Paul notes his equivalent of America's "white male privilege" and trades it for something he considers to be of even more surpassing value - his experience of a call and wilderness spirit quest he identifies with Jesus Christ. There are many who have claimed the same precedence for their conversion to one surpassing value or another - from tea baggers to suicide bombers to urban gangs to monetary profits to family/congregation. The insight here is not in the absolute of a given surpassing value which will focus our life. This is all too common. Rather, listen to verse 13 without reference to your or any particular holy involvement - "I forget what lies behind and strain forward to what lies ahead". Paul's "Jesus" talks about that which is coming after him - Holy Spirit and our doing greater thing than he did. There is talk about post-modern living. Can you imagine what it would mean to be post-Christian? What do you think Paul would want us to forget regarding our current understanding of Jesus and Church that we might join him in stretching forward? With this as thought experiment as encouragement, what do you feel needs to be forgotten that you might move ahead? Note that dreaming is not a passive activity. Dreaming includes laughter as future becomes ever more present. Dreaming includes shouting "Joy!" at the stick-in-the-mud's resistance to move from past to present. Dreaming also includes all the pain and sorrow that is a context in which laughter is such a release. Dreaming also includes all the difficult work to prepare, plant, and nurture seeds into releasing their future. May you dream strongly enough to bear and release the present into a better future. Memory is a powerful tool. It acts as a brake on our journey. We pause to smell a flower and memories come flooding forth as entrancing as any siren Odysseus was ever tempted by. We would linger awhile and awhile longer. What was that larger value we were striving for? I think there might have been one, wasn't there? Sweet opiate of the masses; the way we were. Religious rituals are so comforting. They have shaped us. We can do them in our sleep. "A new thing", you say? Well, OK, go ahead. My memories will prove there is nothing new under the sun. Go ahead with your "new thing." It'll be alright. "Honor and Praise" are your "new thing"? I knew there was a reason I so enjoy my memories, for this "new thing" is so beside the point of steadfast love, of premeditated mercy, of abundant assurance. I remember when co-creator was the "new thing". What do you remember? Indeed! Why wasn't Mary's perfume sold for the benefit of the poor? Why was it even purchased in the first place? Why was a dinner opened to an honored guest and not opened to the poor? We can track cause-and-effect back and back and back even farther. So any High Priest, as well as our very own lowly self, can decide where a difficulty lay and excise that particular and feel extremely proud about having done so. This is a time-tested process to find a scapegoat and hie it to the hinterlands. This process puts each of us into the role of Nard, Mary, Lazarus, Judas, Poor, and High Priest. The trick is to raise this process from the page that leads us to cover up our own continuing way of divide-and-conquer by stealing a reputation with an unanswerable question. A retranslation is needed for verse 8. Here is one suggestion for both individuals and congregations: "You always have (someone to blame for the current situation), but you do not have (an assurance of being beloved)." Presumably folks can make the connection between poor and blame, between Jesus and assurance. - Poverty is not measured in money, but in relationships. - Jesus is a mentor in assurance. - Assurance and Relationships are Related and Learnable. Viewing one another from a human point of view – “intoxicated with the prospect of the worst” [Miss Garnet’s Angel by Sally Vickers] has been popular since G*D succumbed to a first temptation trap of making human’s in G*D’s image and setup a second temptation trap of G*D’s knowledge of good (some) and evil (more than some). Yes, this suggests that if we can look through Christ-colored lenses, G*D can look through Human-colored lenses. What’s good for the goose is good for the gander; what’s good for a G*D image is good for a Human image. Presuming transformation is possible, how do we see reconciling possibilities peeking out from behind our perceptions and beyond our prejudicial experiences? We can begin with preemptive mercy that starts with a metaphoric 490 minus-trespasses – so a particular trespass can’t possibly count against someone. A gift of minus-trespasses keeps us balanced, out of intoxicated prospects. To be in this position of an excess of minus-trespasses is to have begun a new thing, teaching G*D and Neighbor about reconciliation. So we end this passage with a twist – For our sake, Jesus’ abundance of minus-trespasses sparks a new creation of minus-trespasses in us that reconciliation (the righteousness of G*D) might continue and deepen. Keeping silence, keeping secret, keeping closeted, wastes body and soul. A silent, secret groaning, prelude to an earthquake or a volcanic eruption persists at a sub-seismic level. Whether this comes from an eternal heavy hand or an internal fear or learned response, our strength withers and our reserves dwindle. Life-deniers have their moments but not their day. Life-affirmers find their assurance, their belovedness, preceding them around every corner. Celebrate, sing, be glad in Life, rejoice, shout for joy, raise the roof! The silenced, secreted, closeted have nothing to lose but their chains! They shall find and be found and feast - a fresh start! Given the need for food and water, what would it mean for us to know that we are to eat the crops of the land and drink the water of this locale? Here we have a high environmental ethic. We dare not waste or pollute the land – for it will show up as famine or poison and we will die. We dare not waste or pollute the water – for it will show up as drought or poison and we will die. This ethic can also be extended to the old game show featuring questions about animal, vegetable, or mineral. In specific it can reveal to us our prejudices about people. We dare not waste or pollute any of these natural resources – for it will show up as diminished live or poisoned relationships and we will die. This responsibility to not waste or pollute can be a Lenten/Exodus reminder of how easily community can become dysfunctional. We can turn on a source of transformation and redemption, oh so easily. We can fear and take advantage of others, oh so easily. How might we stay away from concepts of manifest destiny and entitlement because of our class or tradition? We may still need to send someone out on a band-aid mission to find a lost sheep or coin, but even more we will be proactive in not losing parts of our lives. We may still need rescue missions for lost souls, but even more we will be proactive in announcing in experiential ways the expansive and expanding love available, no matter what. Issues of acceptable loss and collateral damage are perennial. Who among us would leave 99 assets to go looking for a missing one? Not me. You? Our rejoicing is usually over a profit and the profit off of 99 is not far enough off 100 to spend the time and energy to search for a missing one or to risk having the 99 reduced even further. We would more likely gather folks around to celebrate such a small loss. The whole premise of redemption doesn’t compute in a profit-motive setting. Here everyone is on their own lookout. Lost is lost and gain is gain. Older brothers ought to get theirs first and doubled. This all works until the time comes when we are wandering or lost. Who will care or look for us? Well, if enough others have been let go and we have been complicit in their loss, there won’t be anyone left to look for us. It then is in our best interest to listen again to these three stories and to hear them as prophecy to be engaged with, not “Soupy Soul” illustrations. Sheep, coins, people, ozone layers, civilian casualties, etc., etc. are all too important to easily let them go. Keep looking for your compassion and, when found, engage it expansively. Remembrance of transformations past is part of preparation for a next transformation. You didn’t think this was as good as life gets, did you? So, screw your awareness to a mental sticking place. With awareness safely in place, remember back to one of your most recent transformations. It may have arisen from the inside or been stimulated from the outside. This is basically immaterial. Give this transformation a name – “fear passage”, “famine feast”, “mineral water”, something that identifies it for you. With one transformation under your belt, hearken back to an earlier and earlier transformation. It may have been for you alone or for a whole group with which you identified. Consider transformations others have reported. By now it should be seen that none of these are unusual and that each one contains unexpected energy for its participants. With thanks for all the manure and rain you have received and given, we are ready for a next needed transformation - ready to be aware of it and to engage it. Watch out world. Have you been in a wilderness? Externally, if the wilderness is arid, we yearn for moisture. If it is craggy, we seek a straight path. If it is windy, calm. If swampy, solid soil. Mean streets, green pastures. Internally, the same process abides. We look for that which will swing us again into moderate territory by presenting us with the far side of that which we are currently missing. Of course, when our complementary need arrives it isn't long before that is our wilderness and our yearning is reversed. Transformation goes beyond these pendula of life. It incorporates them both and sees both as faithfully arriving in our moments of extremis. Not only is our soul attached to G*D, but our very rhythms are bound together. Come for water: Come for Torah. Thus runs some rabbinic commentators. Wherever your yearning and call for nurturing rain takes you, follow. With this interpretive tool we continue a journey of redemption, of transformation. We need manure from below to bring additional growth elements to the soil of being. We need rain from above to activate the release of compost. When manure and rain work together a new reality begins to be spoken into being - receive food without money and wine and milk without cost. Bread will be more than simply bread, it will be a revival of ancient dreams, present forgiveness, and future fulfillment. For there cannot be bread without wheat from fertile soil and adequate rain and community reapers and millers and bakers and feasters. Do be sure to read the whole psalm to know again what joy you will have in leaving whatever your current exile entails and to come home secure. What is good for the wheat is good for the fig and the delight of citizens of Newton MA and the world. As you proceed into the day's activities may you recognize opportunities to be a manure-carrier and a rain-maker. Do you think that those whose Lenten experience includes a physical hanging on a cross makes them better saints than those who only avoid chocolate? These kinds of distinctions or arguments go on in every arena of life. Are those who are killed in battle better patriots than those who simply pay their taxes to support a military/industrial/educational complex or participate in some form of "loyal opposition"/conscientious objection? Jesus tells an interesting story. After talking about repenting and repenting again, we hear about the value of manure leading to fruit. This is a process of renewal that reaches back to creation. 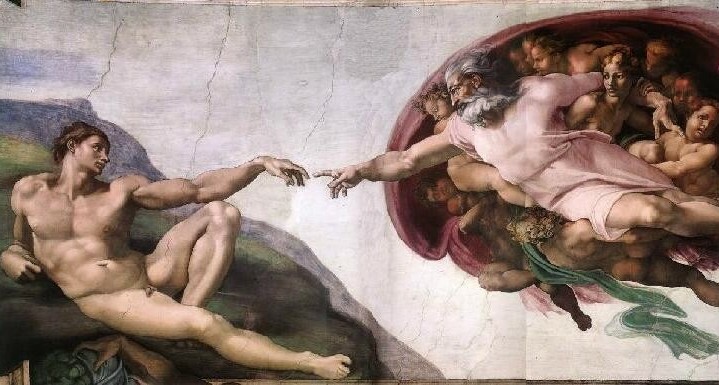 Consider G*D as manure, changing the nature of the dust of the earth into a living being that will eventually return to dust (a slightly different picture than that on the ceiling of the Sistine Chapel). 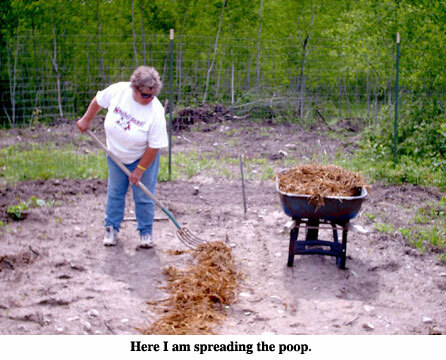 This catalytic nature of manure that will transform dead wood into fruiting wood is worth considering as a process. So it is with forgiveness, an investing in the grounding of another that a different fruit will eventuate. So it is with assurance, an investment in our own ground-of-being that a new flowering will come to pass. Note that this is not an automatic and guaranteed outcome of manure or forgiveness/assurance. There may not be a fruiting, a renewed life. But, without the attempt the odds of change are minimal (remembering that everything is possible). By this wonderful image of manure we pause to consider what element is most needed in our own life that we might come to a point of abundant living, of being restored to our best dust. Is it a more extreme discipline? Is it more coin of the realm? Is it more time to bloom? Is it assurance or forgiveness? Is it a 70% chocolate bar? Well?